Shares in tech giant Apple have been rocked in recent days by fears of a dip in sales. But the company’s vintage high-tech gadgets are still soaring in value. Founders Steve Jobs and Steve Wozniak put together 200 hand-built computers in 1976. 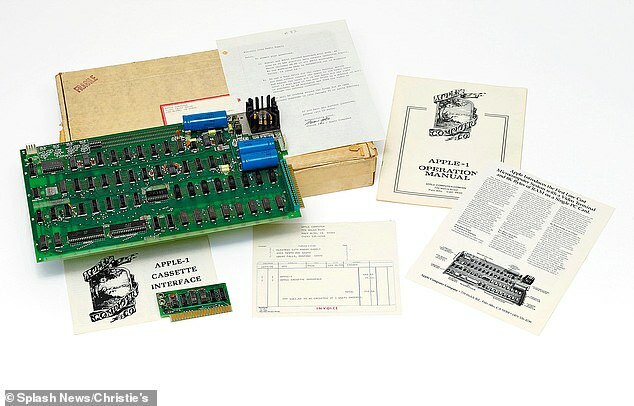 This Apple I prototype sold for £520 at the time and came with a circuit board in a wooden case. Power supply, keyboard and display were extras to buy separately. These early computers can now sell for more than £700,000 if they are still in good working order. The fully encased Apple II, launched in 1977, sold six million worldwide which helps to explain why survivors sell for just £600. The predominantly beige world of computers was then torn apart in 1998 with the arrival of the first Bondi Blue iMac. Collectors pay £500 for an original boxed example. Another innovation was the iPod Classic of 2001. This offered downloaded music rather than cassettes and CDs – and now sell for £200. BAG a free drink at your local pub with non-alcoholic options for those sustaining a dry January. Download the offer to your phone before January 20. For details visit freedrinkoffer.co.uk. GET a £20 M&S gift card when you buy AA breakdown cover from £39 for one year. Visit theaa.com/insert or call 0800 2944142 and quote reference A5739. BUY a Butlins holiday break for this year with 30 per cent off in the January sale and a further £30 discount if booked by Tuesday. Visit butlins.com. READ more for less with 10 per cent off books when you spend £40 or more with Book People using code AFJANUARY – and up to 7 per cent cashback via Quidco. Visit quidco.com/book-people. CUT the price of eating out in January with two-for-one on main meals at Pizza Express. Valid Sunday to Thursday until the end of the month. Visit pizzaexpress.com/offers.